Are DPD’s proposed revisions to our tree code the best we can do? It is important to compare them with what others are doing and one example is the new ordinance passed by Portland, Oregon last year. Portland’s adopted code is much stronger than that proposed by DPD for Seattle. Portland currently has about a 26% canopy cover and has a goal of reaching 33%. Their new ordinance consolidates tree rules under one title. It addresses both public and private trees, both during development and outside development. A City Forester is responsible for trees outside the development process and acts as a consultant during the development process with their development agency and also with a “responsible Engineer” overseeing utility, street trees and other public trees. A two tier permit system to remove trees is established, applications being in writing or online. Prior exemption for single family lots removed because of confusion. Tree for tree replacement required for most permits, with inch for inch replacement or mitigation on 20 “‘ or larger trees. A fee is assessed to process applications. Tree permits must be posted on site. Applicants can appeal city decisions on tree permits. Public can appeal decisions on trees 20” or greater or more than 4 trees per year 12” or larger. Development process focuses on saving large healthy trees, native trees and groves. Building permits require 1/3 of trees on site 12” or larger to be retained or mitigated. Building permits require meeting tree density standards and achieving baseline canopy goals. These are a few of the provisions in Portland’s tree ordinance. It is important to note that this ordinance was developed in a much more open and public process than DPD’ has used. We ask again that DPD post all meetings open to the public on their website so that citizens in Seattle can find opportunities to listen to the discussion and give feedback to the City. We also ask that DPD publicly post all comments submitted on their website, like Shoreline recently did, and like what is happening currently on comments on the Urban Forest Management Plan Update. Our initial observations: This draft is a disappointment but not unexpected considering DPD’s previous proposal. DPD spends the bulk of the 56 page draft ordinance on specific provisions regarding sites where they are issuing building permits and very little on protecting trees outside the development process. While there are some good additions, like requiring all projects to add street trees, this provision already exists in most zones. They are adding it for Single Family Residential and Institutions. And while it appears they are now requiring permits to remove exceptional trees which they define as over 24″ in diameter, at the same time they remove any limitations on removing any trees smaller than this and also remove protections for tree groves. Brennan Staley made the comment at the UFC that one analysis showed that only 14% of the trees in the city were over 24″ dbh, meaning that 86% of the trees could be removed outside the development process with no limitations. Their old definition for removing trees was that they would be saved unless they limit the development potential of a lot. They are now saying an exceptional tree will be saved “unless the location of proposed principle (sic) structure would not allow an adequate tree protection area…” It’s just a different way of saying the sane thing. By simplifying their definition of an exceptional tree to one 24″ in diameter they are removing protections for many trees that the Director’s Rule 16-2008 on Designation of Exceptional Trees classified as exceptional with a much smaller dbh depending on the tree species. Madrona trees for example were classified as exceptional at 6″ dbh and Quacking aspen at 12″ and Pacific dogwood at 6″. They would no longer be exceptional under DPD’s new proposal. Currently people are able to remove 3 trees a year from their property. This is way too many but DPD removes all protections for trees less than 24″ in diameter . The current system is not acceptable because the number needs to be less and because we need a permit system to track loss and hopefully slow loss by educating people on the value of our trees. Vancouver, BC, eg, limits removal to 1 per year. Shoreline’s recently passed ordinance varies the number based on lot size. DPD does nothing to mitigate loss of non-exceptional trees. The problem remains that tree protection should not be under DPD. It should be administered by a department that has a vested interest in saving trees and can be an advocate for doing that, not a Department whose main mission is to help people develop their property and find ways to make it easier for them to remove trees. Possible Departments with more of a mission to save trees include Seattle Public Utilities, Office of Sustainability and Environment and the Parks Department. DPD could still oversee the process of tree protection during development but not over private trees outside development. 1. Adding single family homes and institutions undergoing development to list of zones that must add street trees. 2. Requiring an online permit to remove trees larger than 24″ dbh. 4. Removing single family home lots smaller than 5000 sf from not being covered by new ordinance. 5. Consolidating oversight, regulation and enforcement in a Department without a conflict of interest like DPD has. 11 requirement to id all trees on property in development plans. It is important to note that Portland has approved a much more far reaching ordinance last year to protect their trees citywide that goes into effect in 2013. At the last Urban Forestry Commission meeting Brennon Staley, the DPD lead for the new draft tree ordinance, asserted that if his version is enacted we would have the strongest tree ordinance of any large NW city. I do not agree. I forwarded this post last September to the UFC noting that Portland has made significant moves in their urban forestry protection efforts, including protections for private trees on single family lots. Here are the two pertinent links in that post, You’ll have to log in to the city website to access them. Because the bulk of the new tree ordinance does not go into effect until next year (2013) it appears the new ordinance does not come up easily in a Google search of Portland’s tree policies. This may be the result of an effort by Portland to not confuse the public as to what they are currently required to do. I will be providing more detail on Portland’s law in my public comments later but wanted to give UFC members a chance to check out the links before today’s meeting. We can do a lot more to protect private trees than DPD’s current draft proposes. Who is behind the effort to deregulate tree protection in the city of Seattle? Posted on May 26th, 2012 | Comments Off on Who is behind the effort to deregulate tree protection in the city of Seattle? On Friday, May 25, 2012 Save the Trees-Seattle filed public records requests with the Seattle Department of Planning and Development (DPD) and with the Office of the Mayor regarding their roles in implementing and carrying out the directives in Seattle City Council Resolution 31138 and to find out who else is involved. However in response to this resolution DPD submitted a scoping document in 2011 that mostly ignored the issues and direction that the Seattle City Council asked to be considered. Instead they proposed dropping all existing regulations to protect significant trees and tree groves in Seattle. saying that all that was needed were incentives and education. This is contrary to the direction most other cities are moving. The Seattle Urban Forestry Commission and tree advocates strongly objected to last year’s scoping document’s conclusions and the flawed public review process that DPD held. When asked, DPD’s representative on several occasions publicly stated that they did not have to tell the public where and when public meetings were being held where people could give input. They would not post on the city’s website the places and times publicly paid city workers were discussing the proposed ordinance. They then tried to claim that they sought public input. Unlike Shoreline which last year conducted a public process to receive citizen input on their proposed tree ordinance and posted citizen comment on the website, DPD only “summarized” what input they received and did not release or post what citizens and others actually submitted. They did not as far as we could tell record most public comments at meetings we attended or have a form for people to respond to nor did they take notes of most comments. In other words we did not really see a public record being kept of public input. A DPD representative who is the point person to the Urban Forestry Commission informed the Urban Forestry Commission earlier this month that DPD has now drafted a new proposed tree ordinance. This was news to the Urban Forestry Commission as none of them appeared to have been involved in reviewing or writing this new proposed ordinance even though there are many experts on the Urban Forestry Commission. Who drafted this proposed ordinance which we are told will be released in July for public comment? The recent article in the Seattle Times entitled “Developer interests guide mayor Mayor’s growth proposals” seems to answer the question – Mayor McGinn’s shadow government which is operating out of the public eye. No one in the urban forestry and tree protection community was involved to our knowledge. This secretive cabal of special interest adviser’s to McGinn is operating outside the public eye and without public scrutiny. Yet DPD’s Head – Diane Sugimura is involved and that probably explains how last year’s flawed tree protection proposal supposedly written by DPD and that represents the developer’s position and would have removed protection for most trees in Seattle and that opposed a tree permit system to remove trees, came to be the exact opposite of what the Seattle City Council requested. DPD’s proposal pushed for deregulation rather than protection for trees and Seattle’s urban forest. There will always be differences of opinion on proposed legislation but a process that is a sham and shuts out the public, but listens to special interests, has no place in Seattle. It has no credibility. That is why we are seeking information so that the public knows who is driving this effort to deregulate tree protection in Seattle. We believe the City Council needs to remove the drafting of a new tree ordinance from DPD which has a conflict of interest in representing development interests and not tree protection. They get revenue from issuing building permits, not saving trees. Seattle Public Utilities or the Office of Sustainability and the Environment would be better city Departments to propose draft legislation and oversee such legislation. Nine city Departments deal with tree issues. A combination of the Urban Forestry Commission, the Planning Commission and the Parks Commission would not have a conflict of interest in overseeing a public review process of proposed legislation. DPD did a terribly flawed process and is not to be trusted. This flawed DPD faux public process is in danger of being repeated again. This is the wrong way to draft legislation. Seattle should look to Portland as an example where a public process involved public meetings conducted jointly by their Urban Forestry Commission and their Planning Commission and received strong public support. Legislation crafted by special interests behind closed doors has no place in Seattle and needs to be rejected. It’s up to the City Council to step in to change this flawed process. DPD and their developer interests have a conflict of interest in drafting a tree protection ordinance and should not be in charge of doing so. Comments Off on Who is behind the effort to deregulate tree protection in the city of Seattle? Seattle Department of Planning and Development Continues Faux Public Comment Process. Posted on February 8th, 2011 | Comments Off on Seattle Department of Planning and Development Continues Faux Public Comment Process. The Seattle Department of Planning and Development (DPD) is continuing a rigged phony public involvement process in seeking comment on its proposed plan to deregulate tree protection in Seattle. DPD’s posting of a “Summary of Comments Received on DPD Tree Regulations” does little if anything to clarify the issues involved in trying to protect trees in Seattle or help in drafting real urban forestry and tree protection legislation. The problem starts with the fact that the very people who produced the summary are opposed to tree regulations and proposed to deregulate all tree protection for the City in their draft document. They ignored the Seattle City Council’s resolution #31138 urging development of a proposal to increase tree protection and chose to propose the opposite by wiping out the existing protections for mature trees and tree groves and proposing instead to “provide incentives and educate people to save trees”. They cited no examples of where this has worked elsewhere. Now, rather than publishing the actual letters and comments of those that gave input on their proposal, like other cities have done (eg see Shoreline’s public comments on their tree protection proposal here) , DPD choose instead to anonymously publish what seems to be their edited “notes” of so called public meeting comments and and written comments. At least two separate DPD personnel were probably involved in this so called summation. Without any written record being presented we are expected to accept DPD’s version of feedback made in some instances by “numerous commenters”, while other comments are attributed to a single person or a group. A summation is fine if one can refer to the original comments but all that is available on the Internet by DPD is their version of what was said. Unfortunately many comments are missing fronm their summation or were edited by DPD. Having attended 7 of these community sessions, I noted that no audio or video recording was made at any of these meetings, no one was visibly taking notes most of the time and response forms were maybe present once or twice but otherwise no record seemed to be kept of individual meetings or comments. The summary is not attributed to any author or staff person but was probably done by DPD staffer Brennon Staley since he did many of the meetings mentioned. At the Save the Trees meeting, e.g. to which Brennon Staley was invited, we spent an hour discussing issues. We presented a written 10 point plan on what we felt should be in a good urban forestry protection law. When asked how he was recording our discussion he indicated he was taking “notes”, although I saw little note taking. So in the DPD summary a specific written comment from our handout like “Consolidate oversight, regulation and enforcement in an independent department other than DPD, that does not have a conflict of interest.” became “Consider consolidating all regulations, permits and staff dealing with trees into a single Department.” This is the type of editorial revision that takes place in the summary. Other specific comments like”2 week posting of permits on the Internet and visible sign on the site” are likewise abbreviated and reworded. A comment supposedly attributed to me (my name is misspelled) says “Requirements shouldn’t be based on development potential; they should be based on the existing conditions on a lot” is not how I would have expressed this idea. My comment related to requiring consideration of building within the existing environment, rather than ignoring it, which is what currently policy seems to do. Another comment also attributed to Save the Trees says, “Lots without trees could have their property tax increased.” This is not a Save the Trees position and to attribute a comment supposedly made by an individual in a discussion as from Save the Trees is a misuse and misrepresentation of the organization’s name and position. We submitted an official statement to DPD as to our position and I think it is unprofessional and unethical to ignore those comments and instead allow one or two staff members from DPD to interpret and put in their own words what “the public said”. As neighbors learned in the Ingraham appeal process, DPD instructs its people not to put their policy considerations used to arrive at a decision in writing, so that they cannot be required to be produced and challenged in Court. The same thing has happened in the development of the proposed DPD tree regulations. Internally, the urban forest contingent from the different City Departments has been told not to keep notes of any of their discussions and deliberations. While taxpayers pay their salaries, we are not allowed access to their deliberations. There are no notes kept of meetings according to those we have talked to. So the summary follows a similar process and DPD seemingly thinks this is acceptable and normal procedure for a public process. Don’t publish what people actually wrote or record what they said but “summarize” it and interpret it and emphasize what you want and ignore what you don’t want. It becomes a very subjective evaluation based on the summarizer’s memory and focus and DPD’s politics and bias. This is an attempt to control the dialogue and information flow and discussion. In politics this is called spin. Rather than let the public see the actual comments as written or hear them on an audio or video recording like the City Council does, DPD states that “numerous commenter’s” said such and such and equates many comments as numerous. But what is numerous. Anything more than 1 person, 2, 5 or 10 or more than one group? What did they actually say? The whole process was actually not a very public process besides the Sept. open house, since no other meetings were publicly announced or posted on the City’s website. Although DPD speakers were being paid with tax dollars to basically promote DPD’s tree deregulation proposal, Brennon Staley refused several public requests from me to say where they were speaking. He said he did not have to tell us.He stated this in two separate public meetings. He refused to post any of these taxpayer paid speaking engagements on the website for public outreach. Without any basis, he insinuated that “we would come and disrupt” the meetings. And efforts by us and others to get public input in, when they were excluding public participation at meetings they were speaking at, are labeled as “Organized participation (including letter writing campaigns) by advocacy groups predominantly supported stronger tree protections.” The allusion is that this is not good. I did not know this was something bad, to ask people to respond, when DPD was doing little to invite public involvement or comment. Would this same comment have been made if we were urging people to say we liked DPD’s proposal? All in all, I think DPD’s summary of comments is of limited value except to say there is a diversity of viewpoints out there. DPD has used the summation process to selectively pick certain comments to print, to put their interpretation on them by paraphrasing as best they can remember them without any recording and to exclude other comments. The summary presents a smattering of ideas but equates many as equal by calling them all either numerous or only citing one commenter making it. It’s all political spin by DPD to control the process rather than open the process up for public dialogue. All in all, DPD is trying to create the illusion of public input, while tightly trying to limit and spin to their advantage what the public said. Without recorded comments or producing the written record, we only have DPD’s version of events. And that is not very credible. Comments Off on Seattle Department of Planning and Development Continues Faux Public Comment Process. Ingraham High School Trees to "Scream" on Friday! Posted on January 28th, 2011 | Comments Off on Ingraham High School Trees to "Scream" on Friday! The Seattle School District is going to cut down 27 trees tomorrow Friday Jan 28, 2011 (about one quarter of the NW Grove) at Ingraham High School. For several days the School District has been assembling equipment and preparing to cut down the trees. Tomorrow students have the day off. Tonight just before dark I went over to check things out once again and asked a worker in a hardhat when they were going to cut the trees down. His response was that “tomorrow the trees would be screaming“. It’s strange but I could not think of a more apt response for the trees. If Seattle Mayor McGinn has his way, no trees in Seattle will be protected from destruction. Ingraham is only a precursor to many more trees being lost because Mayor McGinn is proposing to deregulate all tree protection in the city. Strange that someone who supposedly ran with a label as an environmentalist has no love for protecting Seattle’s green infrastructure. When we tried to talk to McGinn and his staff about saving the Ingraham trees he choose to ignore us and wouldn’t even schedule an opportunity for us to discuss the situation with him. McGinn instead has signed off on an initial draft proposal by his Department of Planning and Development to literally remove all protections for trees in Seattle, including tree groves and exceptional trees. The proposal claims that it increases tree protection when it would take us back to before we had any laws to protect trees. The proposal says that instead of laws to protect trees we should trust that education and incentives will protect trees. As if that worked to convince the Seattle School District to save the Ingraham trees. Meanwhile other cities like Lake Forest Park and Kirkland and Issaquah have moved to strengthen their tree ordinances in recent years. Unfortunately, even with current regulations,trees already have no standing in Seattle and no voice because DPD (Seattle’s Department of Planning and Development) gives priority to helping people build whatever they want rather than saving trees and green space. The benefits of trees to clean the air and provide oxygen and reduce storm water runoff and provide habitat to animals and screen noise and pollutants and provide visual delight is given no value when DPD says that trees can be saved except when they limit the development potential of a lot. DPD has a conflict of interest in both trying to help people develop their lots and save trees. Trees almost always lose because DPD assigns them no economic valve despite the services they provide the city. Trees need a voice of their own and should be protected by assigning tree regulatory authority to another city department like Seattle Public Utilities which sees their value in dealing with storm water runoff. They know that as we lose trees we increase man made infrastructure costs to make up for the lost services of our urban forest trees.
. Neighbors and others who want to keep our city green with trees must become a more vocal advocate for trees. Save the Trees – Seattle is working with a city wide group of tree advocates called “Save Our Urban Forest Infrastructure” to enact stronger protections for trees and our urban forest so we don’t become the Emerald City in legend only. Of course the School District has been quiet on specifically when they were going to cut the trees down. At 9:37 PM tonight I got an e-mail from School Board member Sherry Carr in which she said she was just told by facilities that the trees would probably be cut down tomorrow. One of our members, an arborist, told us that the trees can probably be cut down in 2 hours or so. After 70 years of life and good service to the City of Seattle, it’s weird and sad how quickly it can all so needlessly end. The Seattle School District had prepared an Ingraham Master Plan showing they could build the addition on the open lawn on the North side without having to remove any of the tree grove. Yet the School Administration under Superintendent Goodloe Johnson and the Seattle School Board has turned a blind eye to environmental issues, choosing not to help increase Seattle’s tree canopy but instead gouge a chunk out of it by removing some of the city’s oldest trees. What a great lesson for Seattle students about how to live in a world where we are increasing threatened with drastic climate change and environmental degradation as our population and use of the world’s resources increases to have an ever expanding economy based on consumption. Comments Off on Ingraham High School Trees to "Scream" on Friday! It is with sadness that we (Save the Trees – Seattle) announce that we have reached the end of our efforts to save some 29 mature Douglas fir, western red cedar and madrone trees at Ingraham High School. We recently lost our appeal before King County Superior Court Judge Teresa Doyle and are unable to continue with an appeal to the Appellate Court because of the cost and potential liability if we lose on continued appeal. Save the Trees – Seattle has succeeded in reducing the trees to be cut in the NW Grove from an initial 70 to less than 30. The 29 trees to be cut down represent about one quarter of the trees in the NW Grove. We also succeed in saving a mixed conifer madrone grove of the trees on the east side of the school that had been protected for 50 years in an agreement with the Parks Department but which the Seattle School District had targeted for a parking lot. Our efforts to save the NW Tree Grove helped to get the City to pass a stronger interim tree protection law which currently protects tree groves from future development. We also originated the idea and worked to pass legislation to create the current Urban Forestry Commission. And we are working now to fight the proposal by the Mayor and his Department of Planning and Development to deregulate tree protection in the city that would send us back to the roar of chainsaws clearcutting what trees remain in Seattle’s reduced tree canopy which has been reduced by half since the 1970’s. The time to appeal expires as of Dec 9th so we expect the Seattle School District to rev up their chainsaws and cut the trees down as early as this weekend. We urge you to stop by and say good-by to the 29 trees condemned to die because of the City’s and the Seattle School District’s blindness to environmental and ecological values. If the trees are gone when you come by, we urge you to pay homage to the 70 plus years of service they provided the city by reducing stormwater runoff, cleaning our city’s air, producing oxygen for us to breathe, providing a park area for the school and the neighborhood, providing habitat for birds and squirrels and insects and other animals and plant life, for being part of the last 50 plus acres of an uncommon plant habitat in Seattle (a conifer madrone forest), and for just being there for their beauty and serenity. This Sunday (Dec 12, 2010) at 10 AM we will hold a Citizen’s Memorial Service on the North side of the tree grove to honor the trees for their 70 years of service to our neighborhood and city and to say good -by. The street is N 135th between Ashworth Ave N and Meridian Ave N. Please come by and bring something in writing or a sign or flowers or something to post on the wire fence circling the grove. Bring a poem or words or a picture to share with others as we grieve for this unnecessary loss of part of our city and our neighborhood and our green urban forest infrastructure. And vow to write to the Mayor and the Seattle City Council, urging them to reject efforts to eliminate all protections for existing trees as the Mayor proposes. 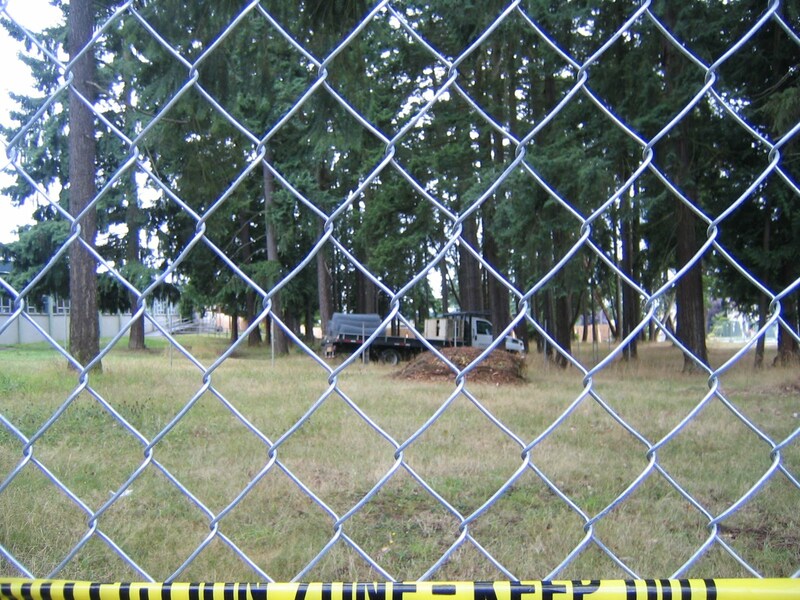 Urge that they strengthen our tree laws to protect trees like those being cut down at Ingraham High School. And if you are able to – please donate to Save the Trees to help pay off our legal bills and support our efforts needed over the next year to get a much stronger tree protection law passed. Contributions can be sent to Save the Trees-Seattle, c/o Steve Zemke, 2131 N 132nd St, Seattle, WA 98133. If you have questions or would like to help in our fight, you can contact us at stevezemke@msn.com or call 206-366-0811. We want to thank everyone who has helped over the last three years. Your support has keep us going. While we have not saved all of the NW Grove, we have reduced the impact and loss overall. We as a group are dedicating ourselves to strengthening our City’s tree laws so that other trees in our city can avoid the fate facing those trees being cut down at Ingraham High School with taxpayer dollars. On Sunday we will pay homage to those trees that are dying an unnatural death despite their long service of 70 years to our city. We hope you will join us in saying thanks on Sunday. PS – Come by and see the trees and post something on the fence or leave something when you can. As I noted, there is no guarantee that the trees won’t be cut down before Sunday. The 29 trees to be cut down are those closest to the west side of the Ingraham High School Building. PPS: Please forward this to others as time is short. Let neighbors and others know and come on Sunday. Resolution of the battle to save the Ingraham Tree Grove is moving forward. On Friday, King County Superior Court Judge Theresa Doyle turned down the Seattle School District’s petition to remove the Court Injunction put in place by Judge Erlick two years ago to prevent the Seattle School District from cutting 70 trees in the grove to end further environmental review. Judge Doyle also denied the Seattle School District’s request for a $187,000 bond. It should be noted that Save the Trees-Seattle has in fact lowered the cost of whatever is built at Ingraham, not increased the cost. The bid, eg, for the compressed west addition came in at $6.5 million dollars. That’s $3.5 million less than the original estimated cost by the Seattle School District. Save the Trees-Seattle agreed to consolidate the two cases before the court. The original case was an appeal of the School District’s Hearing Examiner process arguing that an EIS should have been performed and that a DNS was not appropriate. The second case was an appeal of the City of Seattle inadequate mitigation of the Project. City law calls for giving a priority to protecting rare and uncommon plant and animal habitat. The City Hearing Examiner agreed the NW Tree Grove was an uncommon plant habitat in Seattle but did not require the Seattle School District to move the Project to another site on the campus. Save the Trees- Seattle argued that moving the project to save the NW Tree Grove was one of the legal mitigation options the City had but did not exercise, despite the fact that the School District’s BEX Project manager agreed under oath that the Seattle School District could build the Project on the open North Lawn and not have to cut down any mature trees. The Seattle School District continued to deny that the North Lawn was feasible to build on until forced to acknowledge while under oath the existence of an internal e-mail obtained through public records disclosure that the North Lawn Area was actually considered a future building site for a 2 story addition to the school. Save the Trees – Seattle argues that the School District should build there now and save the NW Grove from being cut down or diminished in size needlessly. The consolidated case is now scheduled to be heard before King County Superior Court Judge Theresa Doyle on Nov.5, 2010 at 11 AM. Save the Trees- Seattle has been working now for almost 3 years, trying to save the NW Grove. Maybe it’s time to check if Seattle Mayor Michael McGinn is still carrying his Sierra Club Card. His Department of Planning and Development (DPD) has issued a controversial draft proposal, entitled City of Seattle Proposed Tree Regulations Dated July 14, 2010. Unfortunately the proposal represents a complete reversal of recent tree protection legislation passed by the Seattle City Council and signed by McGinn’s predecessor, Mayor Greg Nickels. The proposal calls for ending all protection for mature trees in Seattle. It would rescind Director’s Rules 16-2008 which protects exceptional trees in Seattle. Seattle’s urban forest and trees comprise an important component of Seattle’s green infrastructure. Our urban forest reduces costs to taxpayers by reducing storm water runoff and cleaning pollutants from the air we breathe. It provides habitat for wildlife, screens noise and reduces weather impacts. Seattle’s urban forest has been in decline in recent decades, losing canopy and mature trees. The report was prepared in secret without a public process and is being marketed by DPD as the best way to increase our urban forest canopy. Comments will be accepted until Oct 31, 2010. The report proposes that instead of regulation, the city rely on education and incentives to protect trees. Unfortunately there are no good examples of places where this approach has worked. Other cities are strengthening their tree regulations rather than proposing eliminating them. Seattle’s Urban Forestry Commission has reviewed the preliminary draft report and does not support the approach being proposed by DPD. They note that the proposed DPD framework would eliminate protections for trees on 99.5% of Seattle’s property and only apply to the .5% of property being developed each year. Once a building site is complete, there would be no ongoing protections for trees under DPD’s proposal. DPD is presenting their draft proposal to the Regional Development and Sustainability Committee of the Seattle City Council this afternoon, August 17, 2010 from 2 PM to 4 PM. The Urban Forestry Commission will also be discussing at this meeting their problems with the proposal. They have prepared a written response to DPD’s proposal. Neighborhood and environmental activists across the City are outraged by the proposal. They held a public meeting at the Broadview Library on August 8, 2010 and decided to organize a Coalition effort to draft a citizen’s alternative to DPD’s proposal. The consensus of the meeting was that the DPD proposal was so extreme and contrary to public opinion and went in the opposite direction from that which other cities are moving; that DPD could not be trusted to prepare a forward looking and comprehensive proposal that addressed the need of the city to protect and expand our our urban forest and trees. The organizations and community representatives meeting decided to consolidate and focus their efforts to enact a strong urban forestry ordinance under one umbrella group. The group agreed to organize under the auspices of Save the Trees-Seattle which has been fighting to save the old trees at Ingraham High School for the last two and one half years. Save the Trees-Seattle also came up with the idea of Seattle having an Urban Forestry Commission based on science. The City Council created the Urban Forestry Commission last year and they have been meeting since January. Save the Trees – Seattle also worked to pass the interim tree ordinance enacted last year. The new coaltion under the name Save the Trees – Seattle established a legislative committee which will be putting together a citizen’s draft ordinance. They will be seeking public input and welcome tree advocates and others from around the city to participate in the process. They will send their draft proposal to various groups and organizations around the city for review and will be speaking before interested organizations, seeking public feedback. 11. Meaningful and descriptive site plans that show existing and proposed trees to scale. The coalition will meet again on August 29, 2010 at the Broadview Public Library from 1:30 to 4:30 PM. In a bizarre analysis by the Seattle Department of Planning and Development, it is proposed that Seattle no longer protect its large and old trees. This is no joke. They propose incentives as a better way to protect trees, but provide no clear examples or surveys showing this approach works. They argue that because the current system doesn’t seem to work for them, that we should quit trying. This is like BP after a week saying they couldn’t stop the oil flowing into the Gulf so they were giving up. Seattle’s current system doesn’t work largely because DPD doesn’t enforce it. No permits are required by DPD to cut down trees of any size. Under the current interim ordinance someone can supposedly cut down up to 3 trees a year on their property. Although they are not supposed to cut down exceptional trees (which are detailed in Director’s Rule 16-2008), unless diseased or a hazard, the only way DPD follows up is if someone files a complaint. Of course by the time you hear the chainsaw it is too late to stop the tree or trees from being cut down. This is why Seattle needs to put in place an expanded system to require that people get a permit to cut down any tree over 6 inches. I say expanded because we already have a permit program for removing or pruning privately maintained street trees in the right of way. It is administrated by the Seattle Department of Transportation (SDOT). Other cities also require permits before trees can be cut down. The whole idea is to be sure that trees are not removed unnecessarily, that the tree is not really on someone else’s property and that it is not an exceptional tree. An expanded permit system could be required for removal of any tree 6 inches in diameter or larger by private property owners and by the city. Citizens need to know that the city has to follow the same rules as they do. The current DPD proposal only refers to private property. Permits could be several tiered, with exceptional trees being harder to cut down because of increased fees and more requirements to get approval. Hazardous or diseased trees would be able to be removed with minimal or no restrictions. Permits could be applied for on the Internet and posted for a minimum of 1 week before being approved. Physical posting on the property and visible to the public would be required for 1 week before and 1 week after cutting. Arborists working in the city would be required to certified by a professional group and register with the city. They would be required to attend a briefing on the city’s tree regulations. If exceptional trees are cut down without approval, arborists would be fined and or lose their license to do business in the city. It is easier to inform several hundred arborists of our tree and urban forestry regulations than it is to try to inform all the citizens. Most large trees in the city require an arborist to cut in most cases, few homeowners are skilled enough or able to cut large trees in the city without facing potential damage and liability issues. DPD’s analysis is flawed because it emphasizes trees as a burden rather than as a part of Seattle’s infrastructure. Our urban forest and its trees and vegetation reduce storm water runoff, clean the air, reduce noise pollution, provide habitat for birds, insects and other animals, provide aesthetics as a green space and contribute to our quality of life in the city. We can have trees and development; it is not an either/or situation. We need to protect our green infrastructure. Most of Seattle’s canopy increase is coming from increased planting of street trees. We are losing the large old trees with their much larger canopy volume and resultant benefits to city inhabitants. DPD proposal is a major step backward. Let the Seattle City Council and the Mayor know that you oppose the current proposal and that they need to put emphasis on retaining our trees. They represent the green legacy that we need to protect and pass on to future generations living in the Emerald City. It was a long shot expecting the City of Seattle to come to the defense of the old trees at Ingraham High School. The Seattle School District also only sawthe trees as an impediment to their development plans. Now Seattle Hearing Examiner Ann Watanabe has also chose to ignore the evidence in the Hearing Record and Seattle City law requiring that priority be given to protecting uncommon plant and animal habitat in the City of Seattle. She has denied the appeal by Save the Trees-Seattle to stop the 70 year old 100 foot tall eveegreen trees from being cut being cut down at Ingraham High School in North Seattle. The decision is not yet posted on the Hearing Examiner’s website. When it is I will post a link here. The environmental review now goes back to the King County Superior Court. We will be appealing the decision and it will be up to the court to make a final decision. They previously issued a restraining order preventing the Seattle School District from cutting down the 70 year old 100 foot tall Douglas fir, western red cedar and Pacific madrone trees until the environmental review was completed by the City of Seattle. That has now been done. In her most recent decision Seattle hearing Examiner Ann Watanabe chose to ignore testimony from Save the Trees – Seattle that alternative sites for building the school addition were available on the Ingraham campus and that the Seattle School District padded the cost for other sites by adding in features like an additional 2000 square foot entrance on designs for the North side. Of course this raised the cost for any North side addition. The Seattle School District’s designs and cost estimates for alternative sites lacked credibility when closely examined. Many of the issues raised were ignored by the Hearing Examiner. One obvious early sign of the Hearing Examiner’s limiting review of relevant issues was her upholding a preliminary motion by the Seattle School District to exclude testimony on wildlife by one of the witnesses we called, Kirk Prindle, a wildlife biologist who is a member of Seattle’s Urban Forestry Commission. This was despite the submitting of new bird studies for the Seattle School District, which were included in DPD’s file. The Hearing Examiner ignored basic ecological considerations, as did the DPD and the Seattle School District. Groves of trees, particularly groves with conifers are not common in Seattle. The particular association at Ingraham of conifers and madrone trees is an uncommon plant habitat in Seattle. The Hearing Examiner in her previous decision agreed with this. There are only about 52 acres total of conifer madrone forest in all of Seattle, mostly at Seward Park. While there are scatterings of Douglas fir and madrone trees here and there in Seattle what is unique about Ingraham is that it is a 1.2 acre site and a grove of some 130 trees rather than just a few trees. The diversity of plants and animals in a grove is directly correlated with patch or grove size size. The larger the patch size, the more diversity of plants and animals. Because all of Seattle has been logged over, except for some 50 acres of old growth at Schmidt’s Park, the Ingraham Grove represents some of the oldest trees in Seattle. This older growth and uncommon plant habitat should be saved. City environmental law gives a priority for doing this. Yet at Ingraham High School, given the viable option of saving the grove in it’s entirety because alternative sites exist, the Seattle Hearing Examiner has chosen not to. Unfortunately the so called Emerald City of Seattle has a policy that we will save trees unless they prevent the development potential of a site. When this was mentioned by an employee of Seattle’s Department of Planning and Development at a recent urban forest symposium on saving trees, the whole room broke out in spontaneous laughter. Yes it was said seriously but it is a joke obviously when the absurdity of the policy sinks in. Unfortunately the consequence is not a joke. Seattle continues to lose trees, especially during development. Exceptional trees basically have no protection at any time because the whole process is complaint driven. By the time you hear the chainsaw, it is too late to stop a tree from being cut down. So DPD’s proposal is that since the current system doesn’t save trees, let’s scrap the law mandating protection for old trees in the city altogether. It’s like BP after they weren’t able to initially stop the oil flow in the Gulf saying, well this didn’t work so lets just stop trying. One way the city can get some control over continued tree cutting, especially old trees is to expand its current permit system, to require a permit to cut down any tree over 6 inches in diameter on public and private property. The Seattle Department of Transportation already requires a permit before a tree can be cut down or even pruned if it is on the public right of way. Yet the DPD in their just released proposal for a new tree ordinance for the City of Seattle dismisses tree permits altogether and basically argues that we need to just encourage people to do the right thing and save trees by more public outreach and education. Like this has worked. What we need is a change of policy and priorities. In the past people used to shot songbirds to eat. Fashion also threatened the very survival of many bird speicies as birds were killed for their feathers to create lavish “fashionable” hats. Yet we changed public policy to end this absurd killing of birds for money and fashion. Trees are no less valuable living life forms than birds. In fact birds need native trees and shrubs to survive. Unfortunately trees are not mobile like birds. That makes them even more vulnerable. They are living entities of beauty and its an ecological necessity to protect them if birds and insects and other species are to survive on our planet. Obviously the DPD’s proposal is ridiculous to eliminate protection for trees, especially exceptional trees. We require hunting licenses to kill various wildlife and populations are monitored to ensure that overhunting does not occur and a species is wiped out. It’s time to do the same for trees in our city. Trusting that people will not cut down trees wantonly and drive species of associated animals and plants to extinction in our city should not be left to chance and wishful thinking. The current underegulated and unenforced tree protections are resulting in a continued decline of our urban forest. Most tree increases in recent years have been the short lived, small trees that get planted in the parking strips. The large trees and few remaining groves of trees continue to be cut down. Its time to change this. The interim ordinace passed last year limits tree cutting to 3 a year yet even this is not monitored or enforced. Without permits and tracking of trees cut down we have no idea who is doing what. We see plenty of examples everyday however of trees being cut down. Save the Trees-Seattle is working to stop trees being cut down in the city and come up with a workable new tree protection ordinance. You can help support our efforts by making a contribution to Save the Trees-Seattle. Click on the donate button below to make a contribution of $50 or $100 or or $25 or whatever you can so we can continue our efforts to save the trees in Seattle from the chainsaws. You can also send a check to Save the Trees-Seattle, 2131 N 132nd St, Seattle, WA 98133. Thanks.